The Demak District on Indonesia’s most populous island of Java is four years into a five-year plan to restore its disappearing and degraded shoreline. In a collaborative and holistic approach to nature restoration and sustainable development, local and international partners successfully completed many integrated components to build back the shoreline. This “Living Shoreline” vision creates natural defenses against further erosion while increasing economic opportunities for coastal residents. Why is Indonesia vulnerable to climate change? The island of Java and the district of Demak are important economic hubs for Indonesia, a country comprised of over 17,000 islands. As the city’s population grows, its urban footprint spreads into natural and coastal areas at unsustainable rates and with little time for developers to consider the ecological impact. Increased urbanization, in the pursuit of economic development, has led to a rise in emissions, pollution and degradation. Indonesia is the world’s second largest shrimp producer and home to the largest mangrove forest in the world. In addition to logging and pollution, the Food and Agriculture Organization lists shrimp aquaculture as one of the major causes of mangrove loss in Indonesia. 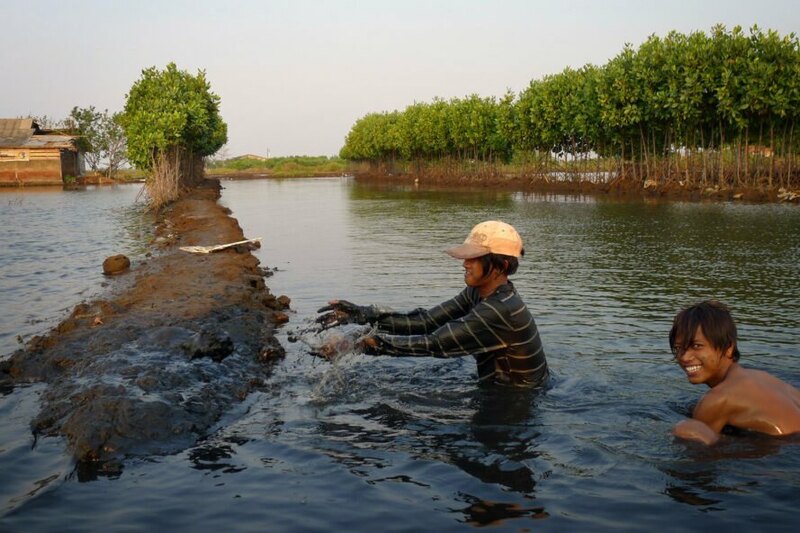 Despite the importance of this coastal habitat as a nursery and breeding ground for shrimp and other species, entrepreneurial farmers are rapidly cutting down mangroves to make way for more aquaculture ponds. Rising urban populations and the construction of new development projects are using Java’s groundwater supply faster than it can be replenished naturally. Overdrawing of water has caused some areas of the coastal district to sink at alarming rates of up to 8 centimeters every year. Sinking causes serious risk for infrastructure such as roads, buildings and homes and puts lives in danger. See how the project vision compares to Wetland International’s prediction of flooding, erosion and evacuation along the same coast. In response to these vulnerabilities, the Building with Nature Project installed resilience-building green infrastructure. First, the team of interdisciplinary partners and local groups constructed nearly 3 miles (4.7 km) of permeable dam structures with bamboo and brushwood. These partially submerged structures trap sediment from coastal erosion but allow water to pass freely. Over time, these structures collect and build back shorelines, which provides a stable coast for mangroves to regrow. The growth of new mangroves and their interconnected web of roots further fortifies the coast. In January 2019, the project partners officially handed over the maintenance of the permeable dams to local community groups. This hand-off is an effort to make the project sustainable and community-owned after the project funding runs out. Though project managers assisted community members with training and outreach to seek further funding from local and regional governments, it remains to be determined how the future maintenance of project infrastructure will be sustainably financed and managed. The project also worked with shrimp farmers to introduce sustainable aquaculture practices. According to the project website, over 422 hectares of ponds have benefited from environmentally friendly practices, and farmers surveyed reported that their income tripled as a result. Seventy hectares of damaged ponds have also been designated for potential mangrove restoration. Community and policy dialogues are underway to address persistent groundwater issues in an effort to integrate new development with the project’s living shoreline vision. The project is unique in its multi-year, multi-sector approach that integrates many environmental and economic approaches to sustainable development. While the longevity and sustainability of the project are still unknown, other cities and small islands are looking to the Building with Nature Project for examples of comprehensive coastal resilience strategies. The Building with Nature Project is a collaboration between an extensive collection of local and international partners, including EcoShape, Wetlands International, the Ministry of Marine Affairs and Fisheries, the Ministry of Public Work and Human Settlement, Witteveen + Bos, Deltares, Wageningen University, UNESCO-IHE, Von Lieberman, the Diponegoro University and local community groups. The project is funded by the Dutch Sustainable Water Fund, The Federal Ministry for the Environment, Nature Conservation and Nuclear Safety (BMU), Waterloo Foundation, Otter Foundation, Topconsortia for Knowledge and Innovation and Mangroves for the Future. 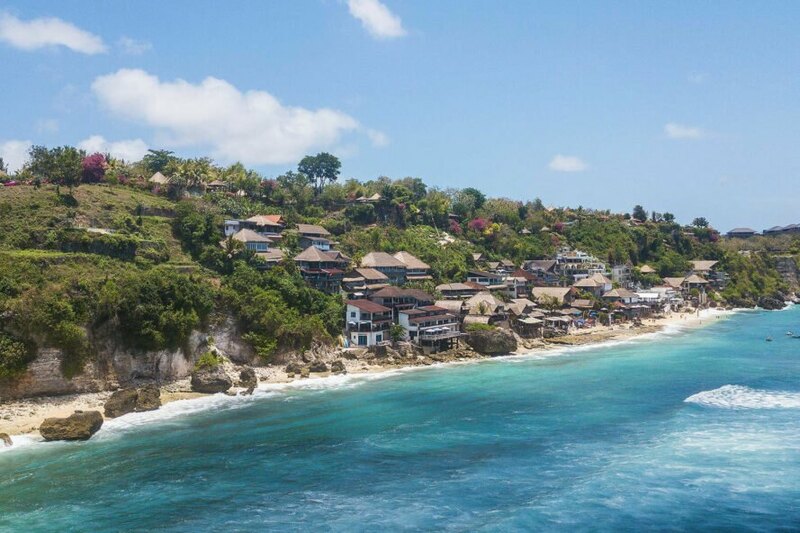 The Demak District on Indonesia's Java island is undergoing a project to restore the degraded shoreline. Indonesia is especially vulnerable to climate change because of unsustainable development, shrimp farming and over-extraction of groundwater. Permeable dams help build back the shoreline. The Building with Nature Project helped shrimp farmers embrace more sustainable practices. The Demak District on Indonesia’s most populous island of Java is four years into a five-year plan to restore its disappearing and degraded shoreline. 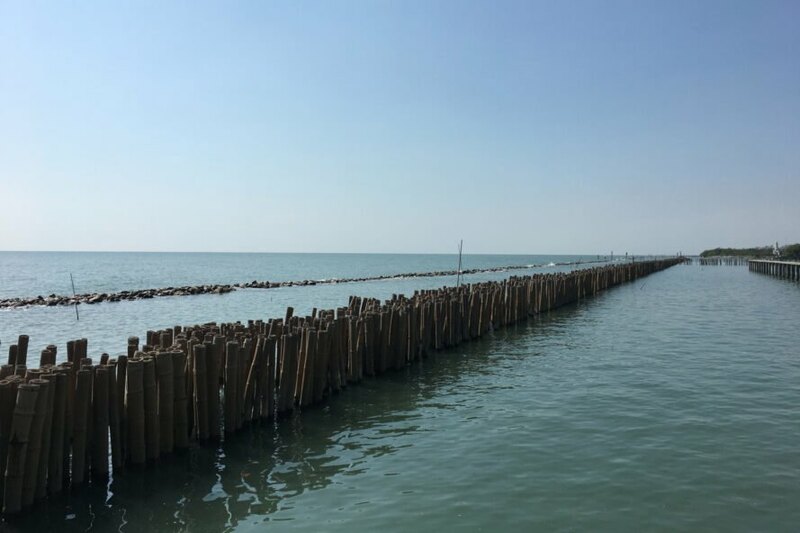 In a collaborative and holistic approach to nature restoration and sustainable development, local and international partners successfully completed many integrated components to build back the shoreline. This "Living Shoreline" vision creates natural defenses against further erosion while increasing economic opportunities for coastal residents.